Por Pan Luang Phor Som Sak Wat Saparean BE2559. Phra Phong Kwong-Kwan Roon 3 Luang Phor Sodh Wat Paknam BE2499. Deep Mould Blok 2 Yant Klap Phisek. Banana skin, Niyom. Material mixed with broken or reject pieces from Paknam roon1 and roon2. It won No1 Placing in Thailand TOT Grand Amulet Competition on 24th January 2016. It won No2 Placing in Thailand ChaengWattana Grand Amulet Competition on 8th May 2016. Attached with Waterproof Gold Longya Waterproof casing. Luang Phor Ngern Pump Roopmuen Wat BangKlan BE2553. Phim Kamakan, Nur Kalaitong. Serial Number 236, made 500 sets only. 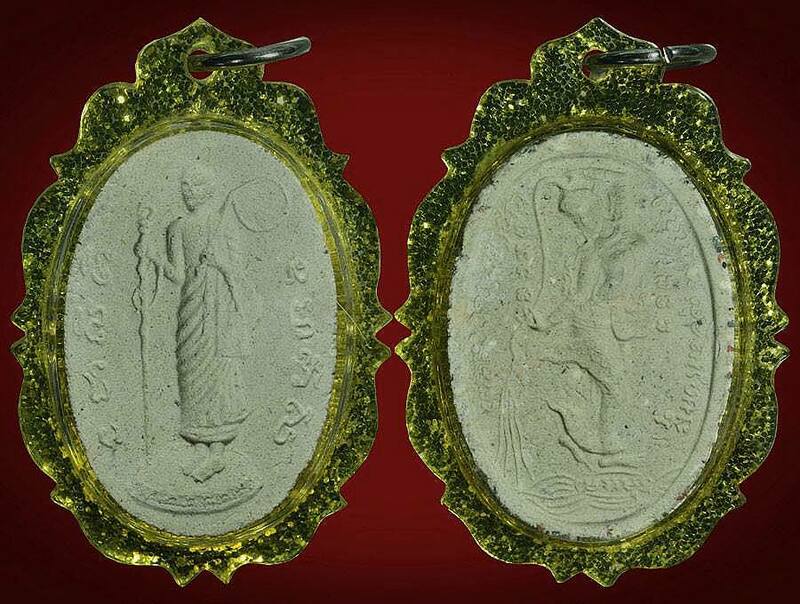 This batch of amulets was made from many old materials such as old coins and yant sheets written by many masters around Thailand. It was mass-chanted in a grand ceremony involving 500 monks held at Wat Bang Klan. 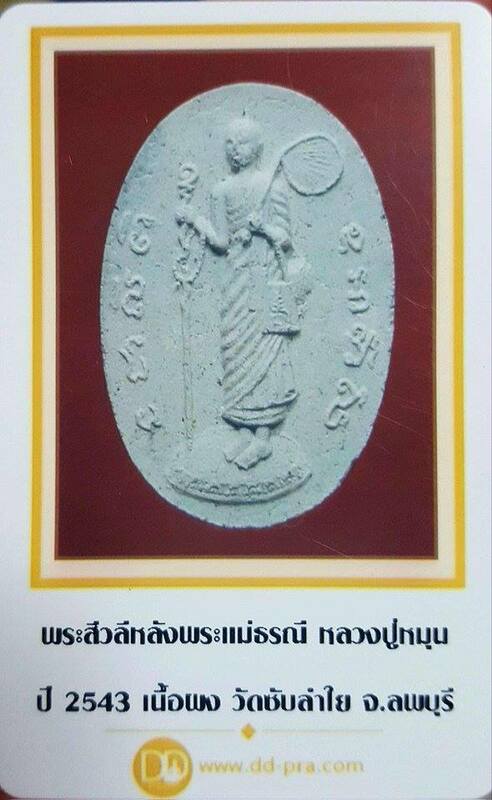 Sivali Lang Mae Torranee Luang Phor Moon Wat Ban Jan BE2543. Good for Metta, Chokh Laap. Approximately 3.3cm. It comes with DD Pra Authentic Certificate. Phor Than Lek Rian Wat Ariyakiri BE2544. Blessed by Phor Than Thian, he was the disciple of Phor Than Lek. Somdej Prok Pho Luang Phor Pilan Wat Rakang BE2407. This Somdej mixed with Phong Bailan and 5 kinds of holy powders of Somdej Toh, which are Phong Pattamang, Phong I-thijay, Phong Maharaj, Phong Buddhakhun & Phong Tri Nisinghe. Luang Phor Pilan was the disciple of Somdej Toh. This Somdej also called Phra Sorng Somdej which means two Somdej made it together. It won No2 Placing in Thailand Songkhla Grand Amulet Competition on 22th May 2016. Attached with Gold Waterproof Casing. Salika Kruba Baeng Wat Bang Tanood BE2555. Nur Phong with ruby and takrut. Inserted with Kruba Baeng’s hair in plastic casing. First Batch Rian Sema Roon Chareonporn Luang Phor Joy Wat Non Thai BE2558. Phim Kamakan, Nur ThongDeang with Thongtip Mask. Serial Number 933. Phra Phong Kwong-Kwan Roon 1 Luang Phor Sodh Wat Paknam BE2493. Blok 1, good condition. Made and blessed personally by Luang Phor Sodh. It won No3 Placing in Thailand Nakhon Rachasima Grand Amulet Competition on 20th March 2016. It won No3 Placing in Thailand Phitsanulok Grand Amulet Competition on 3rd April 2016 again. Lastly it won No2 Placing in Thailand Chonburi Grand Amulet Competition on 24th April 2016. Attached with Waterproof Gold Longya casing. Luang Phor Ngern Pump Roopmuen Wat BangKlan BE2553. Phim Kamakan, Nur ThongLerng Kalainak. Serial Number 236, made 500 sets only. 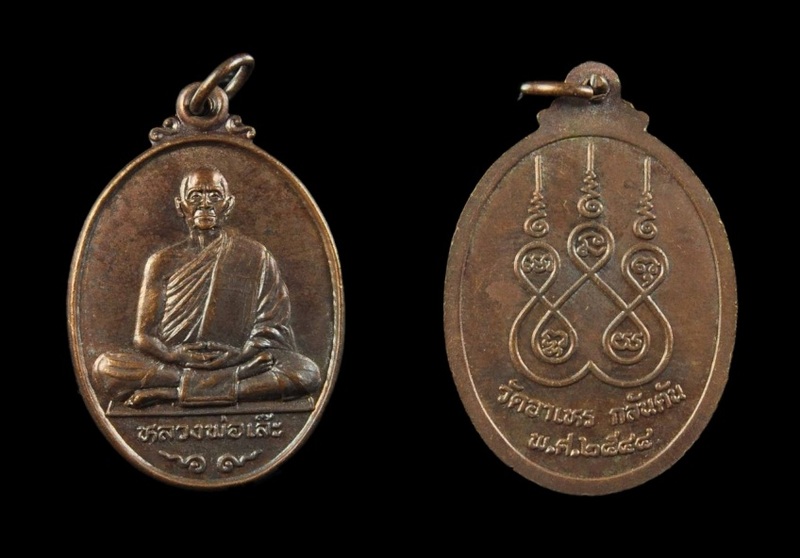 This batch of amulets was made from many old materials such as old coins and yant sheets written by many masters around Thailand. It was mass-chanted in a grand ceremony involving 108 monks held at Wat Bang Klan.